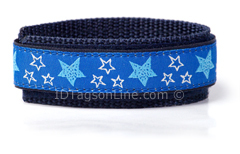 "Blue Stars" Sport wrist band, IDRSP30, is made from traditional Nylon 3/4" (19 mm) backing and 5/8" (16 mm) wide stripe. It features "Blue Stars" ornamental decoration on the front and fits to any size up to 6.5" Max. If you buying this wrist band for your watch , please, consider fit to watch lugs width 16 mm and up.